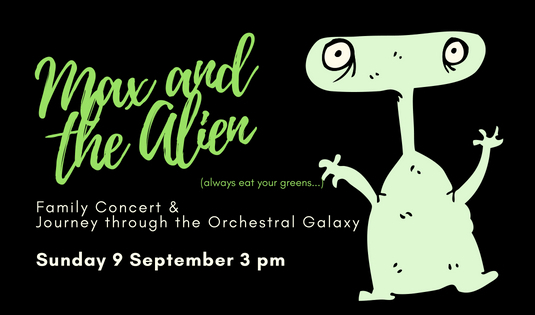 Following on from the sell-out success of The Pied Piper of Pirongia in 2017, Trust Waikato Symphony Orchestra are back with a brand-new show at The Meteor, with an opportunity for audience to get up close and personal with the musicians and their instruments – The Orchestral Galaxy & Max and the Alien. Conducted by local conductor Oliver Barratt (also known for leading the Rusty Player Orchestra and conducting the WCCM Sinfonia) and featuring The Meteor’s own Benny Marama as narrator and brave alien-catcher, Max and the Alien is a modern take on The Boy who cried Wolf. This original story written by Orchestras Central CEO Susan Trodden features well known music from Mozart’s “Eine Kleine Nachtmusik” to Lalo Schifrin’s iconic theme from Mission: Impossible, an opportunity to sing along with the orchestra, and a special ‘Journey through the Orchestral Galaxy’ where audience members will be encouraged to move through the orchestra and meet the musicians. The perfect opportunity to bring younger family members to experience the orchestra, with just enough humour to entertain older ones, along with a programme of exciting orchestral music that everyone will love, this promises to be another memorable day out for young and old. As well as tiered seating in the auditorium young ones are welcome to bring a cushion so they can sit right near the action (and watch out for flying aliens!). Tickets are $12.50 per family, or $5 per person (door sales).